First off- that 16 oz beer cost me only 2500 won- not much over $2! The problem was, they were selling out so fast you had to look hard for one that was even cool. Eventually they just started storing them in freezers with the ice cream. Second- thinking I was going to eat something at the track, I put off dinner, and I won't be making that mistake again. I ended up with some kind of dried fish and a bag of chips for dinner. What I would have given for some Miller Park food! 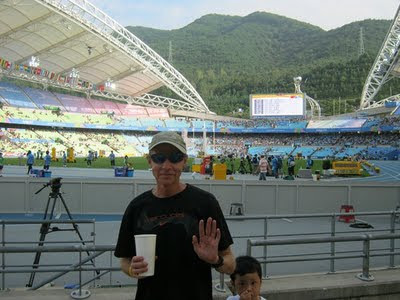 Third- getting there was simple- they had shuttle busses ready at Dongdaegu station that took us right to the track. Getting home was another story- after waiting in a non-moving bus line I took off decided to join a crowd of spectators leaving on foot- presumably to the nearest subway station. I presumed correct and got back to Dongdaegu with about 30 min to spare prior the last train departing to Waegwan. I finally got back to my hotel right around midnight. Tonite the meet goes even later, so I am thinking I might get a head start and skip the women's 100 meter, check the bus line, or just jog the 1.5 miles or so to the subway. Hope I make it. Finally, I am undecided if Usain Bolt is good for the sport or not. No question he was the reason many were there last night (I spoke to one Korean guy in line that took the KTX fast train down from Seoul and was heading back right after) but his antics were starting to get a little over the top for me. I admit seeing him false start and get dq'd was something that I thought was just what the doctor ordered to tone down his act. We'll see if he takes it out on the 200 meter guys. The 10K went about as expected in a world championship- nobody wants to take it out resulting in a slow early pace with a mad dash at the end. Poor Galen Rupp never had a chance. 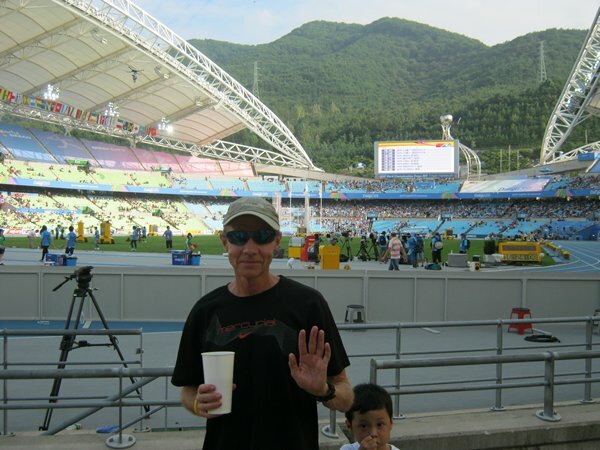 I am heading down to Daegu to watch some of the track and field world championships shortly. Started the day with a hard 13.1 mile run in 1 hr 33 min. I am still debating the benefits of cycling during hard training. I don't do long rides, but over the last 2 days I have covered 20 miles, some of it pretty high intensity. I'm pretty sure those miles made today's run more difficult, but is that good or bad? What's more effective, running 1:33 on tired legs or 1:28 on fresh ones? Almost half of today's run was on dirt and stones, not very fast, so I am optimistic that I can knock this time down further (last week I did 1 hr 36). Day I- swimming and Transition 1. This will be fun to see the kids put it all together on race day this Saturday. Check out this AFX Ankle Foot maXimizer designed to strengthen muscles below the knee-something every runner could possibly benefit from. I've watched the videos and agree the traditional approaches to strengthening those tissues (bands, curling a towel with your toes, etc.) are inferior to this device) for preventing or treating common running injuries such as shin splints or plantar fascitis. Should You Spend More on Running Shoes? I stumbled onto this video, of all places, on the yahoo finance page Should You Save or Splurge on Running Shoes? Bottom line is they recommend that you splurge, and I could not disagree more. For the most part, I've been able to stick to the $50 or less for running shoes rule for as long as I can remember, with few exceptions. I routinely look for shoes marked clearance, discount, discountinued, 20% or more off, sale, you name it. My guess is it's more important for you to run more off-road if you want to reduce injury. 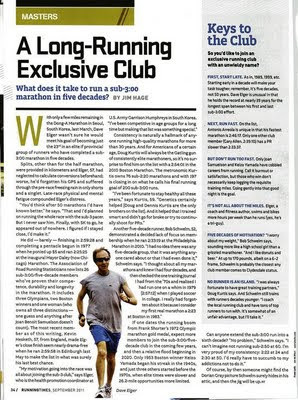 Check out one of my posts from 2009 Why Expensive Running Shoes May Be a Waste of Money. Sat: 13.1 miles in 1 hr 39. last 2 miles under 7 per mile. Negative split ave about 7:15 per mile coming back. Sun: 18.5 mile bike, 500 swim in 10:03. I am feeling pretty good about where I am at right now- I felt a little discomfort in my achilles on that Sat long run so cut it short and will be careful - heel lifts in my walking around shoes, eccentric calf work, and stretching before running. Next race is the Pyeongtaek Half Marathon Oct 2. Can't wait! Yes, I probably could have run today after a 15 miler yesterday. My question is, will it help me race faster 2 months from now? I am banking on the answer being no, but I guess that depends on how much damage my leg muscle fibers have endured and the length of time needed to recover. There is a time and place for overstepping the boundaries of fatigue, but the day following your longest run of the week is probably the best time to lay low or do something else. Intuitively, I like to use 2 hours as a threshold for not running the next day, but that doesn't mean I don't cross train. I feel surprisingly good on the bike the day after a long run! It's a constant dilema among serious runners- what's more important- a higher weekly mileage total or sacrficing some easy miles in hopes of turning in an extra quality workout? Normally, if I can bounce back with a good session on Tuesday following a Sunday long run, I think I've made the correct decision. Weekly Update- Miles or Quality? Sun: 15 miles slow- just working on completing the distance. Tues: 7 x 800 meters on turf, 60 sec recovery. All 2:56 or faster. Great workout! Total= only 42 miles. 9.5 miles under 7 min pace. My weekly total is too low, and I'm thinking it may be a better approach to just target one week a month to really nail a high number of sub 7 min miles. Increasing weekly distance while trying to run more quality runs at the same time isn't going to work. I'm encouraged by the Tuesday workout, but Fri and Sat felt way too hard. Thanks for the free publicity! Author Jim Hage bio. Like it or not, long runs are a crucial piece of any marathon training program. Guilty of neglecting the long one (my definition of long is anything over 2 hours or 14 miles)for some time now, it's time to see if I can get back into it. Here are some of the principles I am putting to work. 1. Run a new route. I find tackling the same route week after week mentally draining, so I've decided to seek out some new places to run. What a difference when you don't really know where you are going to run or maybe for how long! The danger is getting caught running considerably longer than you plan, which may actually be a good thing. 2. 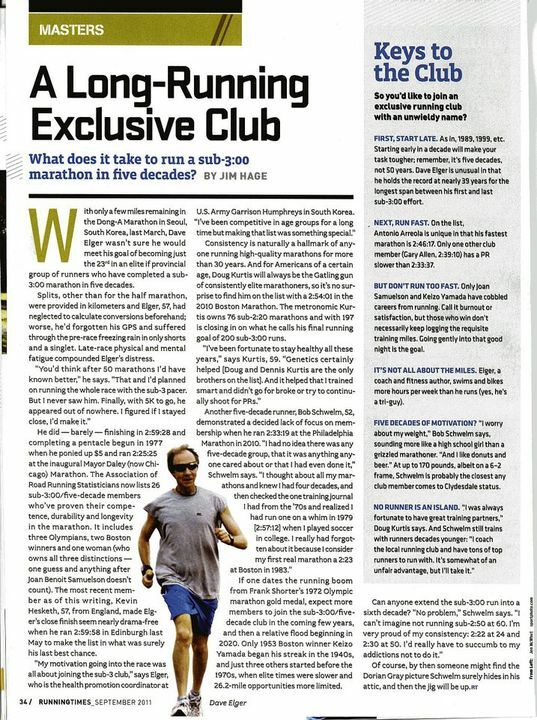 If you can, try to put together 4-5 different long run options, but keep one as sort of a time trial course that you periodically can go back to and test your fitness. 3. Find some off-road. If you are running your long ones on roads, see if you can include some off-road miles. I think it helps recovery. 4. Slow down and forget pace, especially in the dead of summer and winter. If it's been a while since your last 2 hour run, keep the pace slow enough so you still feel ok by the time you hit 10 miles. Today I even went so far as to plan one minute walks every 10 minutes of running (yes-Galloway!). There is something to be said for time rather than distance when quantifying the value of your workouts. 5. Take breaks. It's foolish to think that you diminish the effects of a long run by taking a 5 minute break. I routinely take breaks this long, especially to cool down in hot weather. 6. Leave early. In the summer heat, get out the door early. 7. Extra water. Staying hydrated is crucial. Weigh yourself before and after to make sure you are not losing more than 2% of your body weight. Carry water and/or money. 8. Put in some miles the day before. I'm not ready for 20 miles in one day, but I can do that much on consecutive days. Yesterday I put in a comfortable 11 miles, followed by 15 today. Once my fitness level improves I'll drop the miles on that first day and try to make that second day count. 9. If you are training for a marathon, allow yourself at least 3 months to prepare if you currently have a decent base and can run up to 10 miles. If not, then give yourself 6 months to build up. 10. Run with somebody. I run alone 99% of the time, mainly because I like the convenience of running from home, running my own pace, and not being committed to being someplace at a specific time. However, if you are having trouble psyching yourself to get out the door, it's an option to consider.